In 1969, Ken Thompson of Bell Laboratories wrote the first version of Unix. In 1973, Ken Thompson teamed up with Dennis Ritchie and they rewrote the Unix kernel in C.
One maintained by Bell Labs. Most common on large multi-user systems. Most popular variant was SVR4 (1990) which incorporated many ideas from the second branch and its variants. The second maintained by UC Berkley's Computer Systems Research Group. Known as BSD (Berkeley Software Distribution) or Berkeley Unix. BSD was mostly used in personal workstations. Code written for BSD was often borrowed by other OSes such as SVR4 and Windows. There are many small differences. One difference is in the way the ps command functions. Both branches were licensed and heavily modified by major computer companies. In the early 1990's, Linus Torvalds developed Linux. Linux is a UNIX-like OS kernel based loosely on the educational OS MINIX (Minimal Unix). 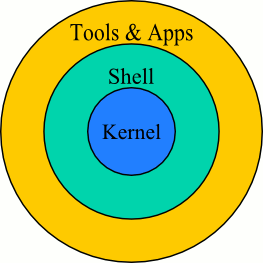 It provides most of the features of SysV and BSD kernels. The GNU Project provides shell and tools that complement Linux and make it a powerful, competitive and popular operating system. There are many different implementations of Unix. They all have subtle differences in the way that they operate. Solaris (Sun Microsystems)–Originally called SunOS and based on BSD. Sun took a new direction with SunOS 5, partnered with AT&T to create SVR4 and used it as the basis for its new OS. Hercules and CL115 use Solaris 9 as their OS. IRIX (SGI–Silicon Graphics)–Based on SVR4 with BSD extensions. Mac OS X (Apple)–Based on a BSD variant called Darwin. The computers CL135 and their server, mcserver are available to students in certain courses. A few Linux distributions are the following. Some are free. Others the user must pay for a support contract. Scientific Linux–a stable variant of Red Hat that is used in CL115. Ubuntu–a very friendly and popular version of Linux. Based on Debian. Many consider it the strongest contender for a Linux alternative to Windows. Slackware–one of the oldest Linux distributions. One of its major goals is to be the most UNIX-like Linux. There are several different shells, they offer their own advantages and disadvantages. For instance, some allow for auto completion using the tab key; others don't. tcsh: The default shell for the UofR CS Department. C-shell enhanced with file name completion and command line editing. For more on shells, click here. How do you get your shell? Before you get a shell, you identify yourself with a login name and password. That login name is looked up in a file called /etc/passwd, which describes each user's account. More specifically, it tells your unique numeric ID, principal group ID, general information, home directory, and shell. Note, each of these attributes are separated by a : (colon). The last attribute on the line is your shell. If you are feeling daring you can change your shell with the chsh command. More information about /etc/passwd can be found here. getline for reading Strings is useful if you suspect that you will have longer lines, since Strings are dynamically allocated. The following is meant as a review of how to dynamically allocate and free up space. s4=strdup("hello");   //make copy of "hello"
returns a pointer to a new string that is a duplicate of the string pointed to by s. The returned pointer should be released with free() because the space for the new string is obtained using malloc. If the new string cannot be created, a null pointer is returned. Don't forget to release any memory you request while copying strings after you are done using it. where str is the line (or C string) that you want to split into tokens or words, and delimiters are an array of characters in which any one of the characters delimits or marks the boundaries between words. cstr1 before being tokenized: This is a sample string. Is it working?